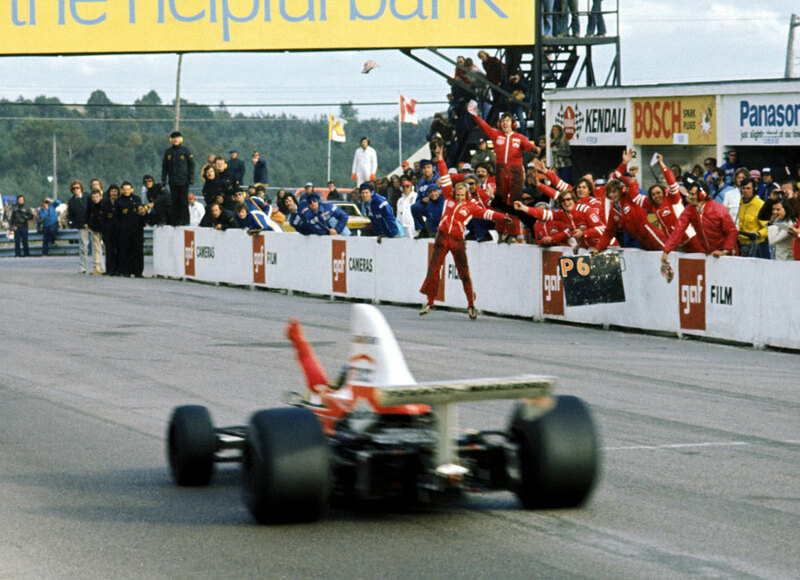 Emerson Fittipaldi won at Mosport to move level on points with Clay Regazzoni and take the championship down to the final race. After Ronnie Peterson's victory at Monza five drivers went in to the penultimate round of the season separated by just 15 points. Regazzoni led the way on 46 points with Jody Scheckter just a point behind and Fittipaldi on 43. Niki Lauda and Peterson were also in with a chance, albeit a slim one, as the paddock regrouped in Canada. Though some of the smaller teams had decided to remain in Europe, numbers were boosted by a Parnelli for Mario Andretti and the debut of Penske with Mark Donohue at the wheel of the PC1. Fittipaldi qualified on pole ahead of Lauda and Scheckter, with Carlos Reutemann, Jean-Pierre Jarier fifth and Regazzoni alongside him in sixth. Peterson's slight hopes took a blow when he could only line up tenth on the grid. Lauda took the lead on the opening lap from Fittipaldi and the fast-starting Regazzoni, with Scheckter in fourth place. On lap three, Scheckter snatched third from Regazzoni and began to chase down the leaders. With the positions as they were, three drivers were provisionally on the same amount of points in the standings with Fittipaldi, Regazzoni and Scheckter all set to move on to 49 with Lauda on 47. However, at around half distance Scheckter's brakes gave up and he crashed out. From that point on it looked like Lauda would take the victory as he maintained an advantage of at least five seconds over Fittipaldi. Then, with ten laps remaining, Lauda spun out of the race after hitting a patch of sand, allowing Fittiapldi to inherit a comfortable lead and claim a crucial win. The battle for second was more intense, with Regazzoni coming under pressure after the impressive Peterson had passed James Hunt in the Hesketh for third place. The Ferrari just held on, with Peterson completing the podium ahead of Hunt as the trio were separated by just 2.6s. Patrick Depailler was fifth for Tyrrell ahead of Denny Hulme's McLaren. Heading to Watkins Glen Fittipaldi and Regazzoni were now level on 52 points each, with Scheckter third on 45. Lauda's fourth consecutive retirement dropped him out of the running, while Peterson's third place was also not enough to keep him in contention.